1. Bundle-style installer packages – This style of installer package is created as a Mac OS X bundle that contains scripts and a description of the package requirements and behaviors. As part of creating a bundle-style package, you can define scripts that will execute before or after the installation. 2. Flat installer packages – This type of installer package was first introduced in Mac OS X 10.5 and is a single file. This style of installer package is created as a xar archive that contains scripts and a description of the package requirements and behavior. The preflight script is run before files are being installed. If the script does not return an exit status of zero, Installer will cancel the installation. The preinstall script is run before files are being installed and after the preflight script if one is defined. This script is run only if the component is being installed for the first time. If the script does not return an exit status of zero, Installer will cancel the installation. The preupgrade script is run before files are being installed and after the preflight script if one is defined. This script is run only if the component has been previously installed. If the script does not return an exit status of zero, Installer will cancel the installation. The postinstall script is run after files have been installed and before the postflight script if one is defined. This script is run only if the component is being installed for the first time. If the script does not return an exit status of zero, Installer will declare the installation has failed. The postupgrade script is run after files have been installed and before the postflight script if one is defined. This script is run only if the component has been previously installed. If the script does not return an exit status of zero, Installer will declare the installation has failed. The postflight script is run after files have been installed. If the script does not return an exit status of zero, Installer will declare the installation has failed. The other categories of scripts used in bundle-style installer packages depend on something being installed. Since payload-free packages do not install files, these script categories would not execute properly. The preinstall script is run before files are being installed. If the script does not return an exit status of zero, Installer will cancel the installation. The postinstall script is run after files have been installed. If the script does not return an exit status of zero, Installer will declare the installation failed. When working with bundle-style and flat packages, one thing to keep in mind is that the script category names will not match up across the different types of installer packages. The table below shows the equivalents between the script types. A commonality between scripts used in bundle-style and flat installer packages is that the scripts must return an exit status of zero or else the Installer application will either cancel the installation process or report that the installation has failed. If you’re building a shell script for a payload-free package, one way to ensure that the script returns an exit status of zero to the Installer application is by including exit 0 at the end of your script. When building a payload-free package, it’s helpful to know that the Installer application can automatically pass along information to the script using variables. The table below shows the variables that are available for use with shell scripts. Here’s an example of using the $3 variable in a payload-free package script. In this case, we can take advantage of the Installer process telling us which drive the package is being installed on by using the $3 variable as the target of our script’s actions. If you want to know more about the process that Payload-Free Package Creator uses, I have a post on how how to use pkgbuild to create payload-free packages. One thing to be aware of when using payload-free installer packages to run commands is that payload-free flat packages may not leave an installer receipt behind. 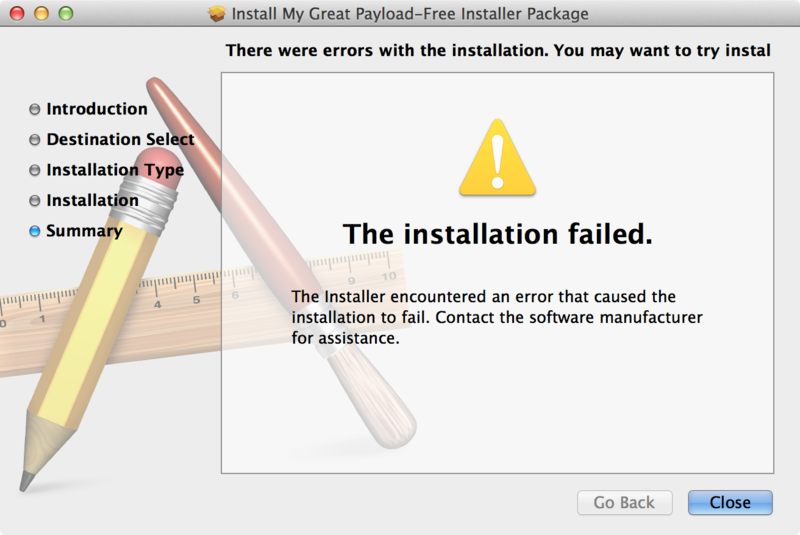 When installing a payload-free package built with Apple’s pkgbuild tool using the —nopayload flag, no receipt is created as part of the installation process. When asked about this behavior, Apple’s response was that this is an intended behavior for payload-free packages built using pkgbuild as the principal purpose of receipts is to track upgrade behavior. Apple further stated in their response that payload-free packages are intended to be a convenient container for scripts. Using payload-free packages to deploy scripts has been a vital part of my toolkit for many years. Understanding the functionality that payload-free packages can offer, and knowing how to quickly create them to meet your needs, will hopefully add them to yours as well. Excellent write up. Particularly since it can be confusing the first time around, understanding the terminology for preflight and preinstall. Don’t recall seeing the usual “see below the jump”. Great write up! Love how it is all laid out! Thanks!